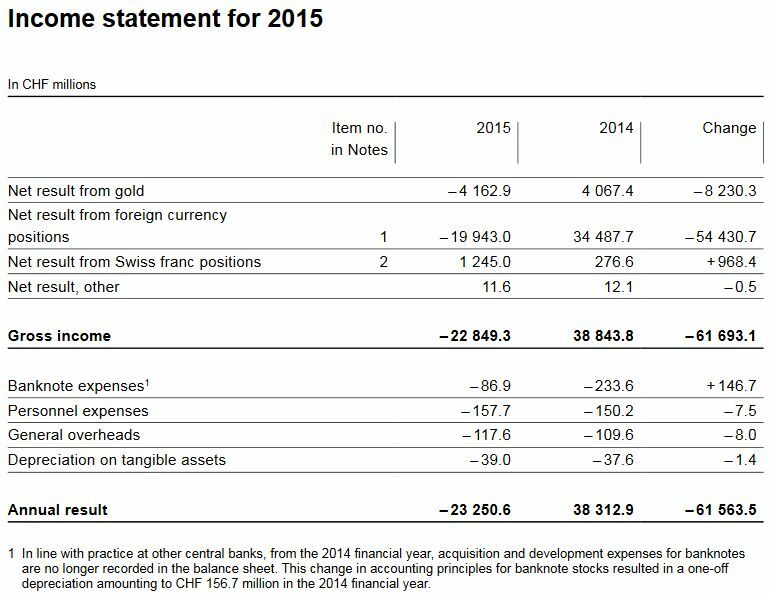 The Swiss National Bank (SNB) is reporting a loss of CHF 23.3 billion for the year 2015 (2014: profit of CHF 38.3 billion). The loss on foreign currency positions amounted to CHF 19.9 billion. A valuation loss of CHF 4.2 billion was recorded on gold holdings. The profit on Swiss franc positions was CHF 1.2 billion. For the financial year just ended, the SNB has set the allocation to the provisions for currency reserves at CHF 1.4 billion. Taken together, the annual loss and allocation to provisions totalling CHF 24.6 billion are less than the distribution reserve, which amounts to CHF 27.5 billion. Thus, despite the annual loss, the resulting net profit will allow a dividend payment to shareholders of CHF 1.5 million as well as the ordinary profit distribution of CHF 1 billion to the Confederation and the cantons. The distribution reserve after appropriation of profit will amount to CHF 1.9 billion. Annual results are not really definite. Given that the SNB accumulates foreign currencies with interventions, they have huge swings. But the SNB may lose 50 billion in one year and win 60 billion in the next year or the opposite. Overall, the loss on foreign currency positions was CHF 19.9 billion (2014: profit of CHF 34.5 billion). The appreciation of the Swiss franc resulted in total exchange rate losses of CHF 26.4 billion. Interest income amounted to CHF 7.8 billion and dividend income to CHF 2.2 billion, however. Movements in bond prices differed from those in share prices. A loss of CHF 5.1 billion was recorded on interest-bearing paper and instruments. By contrast, equity securities and instruments contributed CHF 1.6 billion to the net result. At CHF 34,103 per kilogram, the price of gold was 11% lower than at the end of 2014 (CHF 38,105). This gave rise to a valuation loss of CHF 4.2 billion on the unchanged holdings of 1,040 tonnes of gold (2014: valuation gain of CHF 4.1 billion). Even if the gold price is rising, its parts of the balance sheets is falling. While the SNB supports foreign stock markets and foreign companies, it does not invest in Swiss stocks. The profit on Swiss franc positions, which totalled CHF 1,245.0 million (2014: CHF 276.6 million), essentially comprised CHF 1,163.9 million of negative interest charged on sight deposits since 22 January 2015, interest income of CHF 66.5 million and price gains of CHF 24.4 million. Furthermore the SNB harms the Swiss economy, when it reduces the profits of Swiss banks by negative interest rates. With this measure it maintains its own profitability. Banknotes in circulation: +5.28 bn francs. The old form of printing press, today a less important form of central bank interventions. 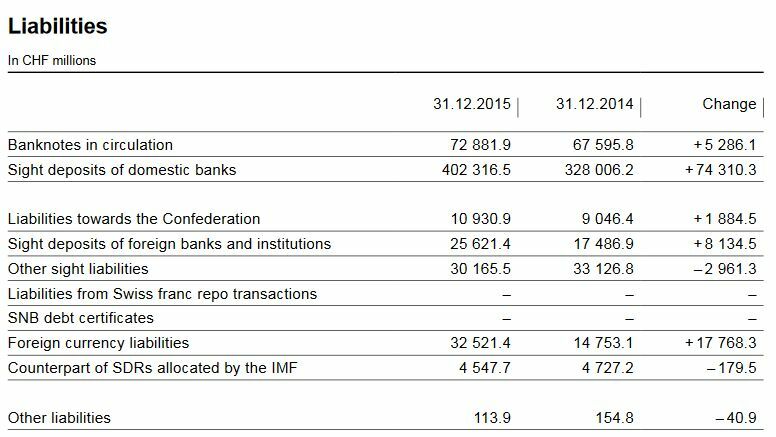 The allocation to provisions for currency reserves amounted to CHF 1.4 billion. The figure is lower than in the previous year (CHF 2.0 billion) because the average period for the calculation of the allocation upon which the 2015 financial year is based includes several years with low nominal GDP growth rates. At 1.2%, average nominal GDP growth was therefore lower than in the relevant previous period (1.8%). For the 2015 financial year, as in the preceding years, the basis for calculating the allocation was twice the average nominal GDP growth rate for the previous five years. 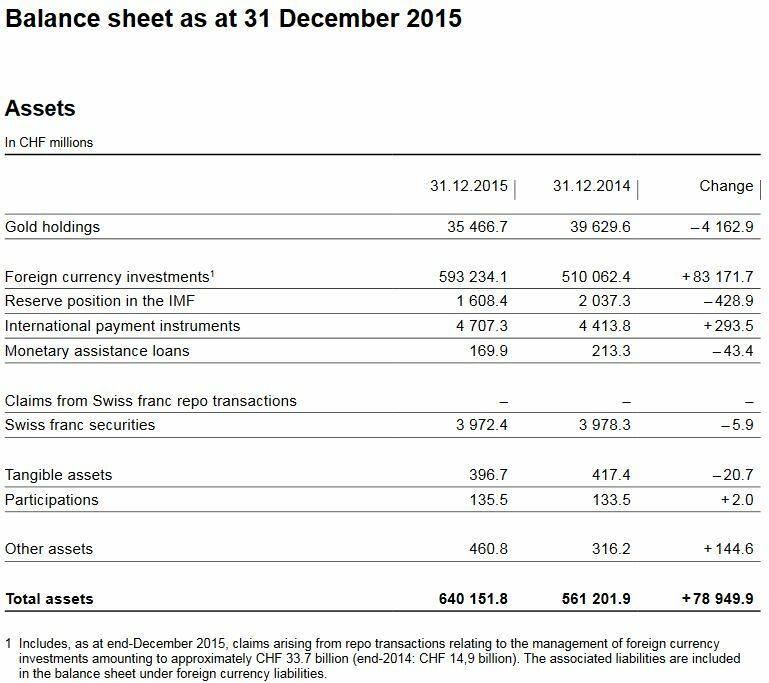 SNB announces 24 bn CHF profit for 2016 thanks to rising stock markets.